Land for sale in Comporta, Muda. Infrastructure Each farm estate will include access roads and connections to water, electricity and telecommunication networks. 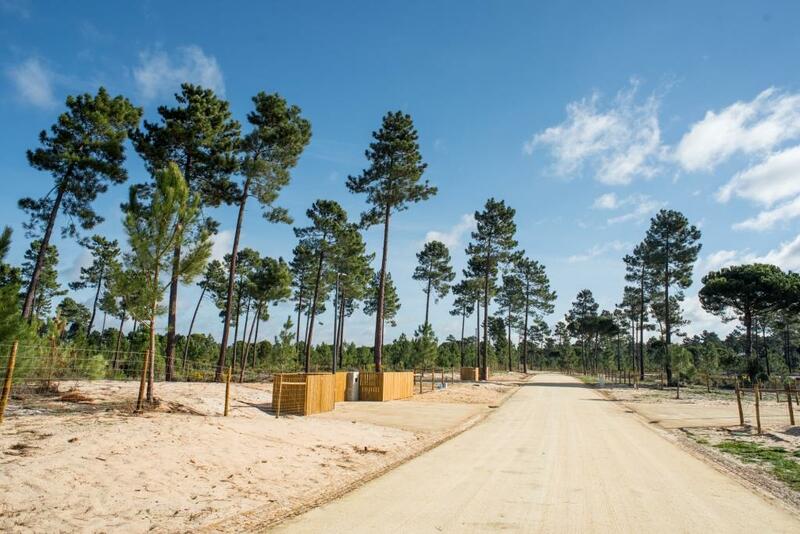 Each parcel of land in Comporta will allow for the construction of a home with a private area of up to 500 sqm. which may be developed by your chosen architect’s practice or with one of our renowned practices; Saraiva and Associados, Conceitos de Arte, Intergaup or GCCM. Each parcel of land, once your home is built will provide a new concept of living that combines countryside and beach life with complete privacy and comfort. This rural but near beach project in Comporta develops around the future petite and picturesque village of Muda which will enhance the living standards and convenience for all property owners by providing a local church, playing fields, children’s playground, retail support services such as grocery, mini-market, restaurant and a kiosk selling your daily newspapers and magazines. Additional parcels of land for sale in Comporta within this exclusive estate vary between 4 and 6 hectares with the same construction area of 500 sqm with prices starting from a little over €1m. Ask for details or book your visit today. Muda is located within one of the most privileged areas of Portugal, Comporta; A sleepy little fishing village and agricultural estate which abuts the Atlantic Ocean and Sado Estuary, slightly more than one-hour south of Lisbon. Muda, took its name from the exchange point for carriages and horses before the modern vehicle was available and has since become the most exclusive country estate area of Comporta. Muda is conveniently located between Grandola and Comporta and is a short ten-minute drive to some of the most spectacular beaches to be found anywhere in Europe. Up until the release of this development, existing homes and land for sale in Comporta, Muda were extremely difficult to find with prices generally reaching €3m for a suitable home and estate. As the years pass by exclusive parcels of land in Comporta for sale will be limited and therefore we expect to see a significant price increase as demand strengthens. Comporta is located one-hour south of Lisbon and the international airport which can be reached by most major European cities within three-hours or less. As there are a limited number of these country estates available, we recommend that you book your visit as soon as is physically possible. Living Portugal Property have been selling real estate in Comporta for over ten years and have an enviable reputation for being one of the most knowledgeable real estate brokers in Comporta and throughout the Alentejo. Hall, kitchen, office, 4 lounge areas, 8 bedrooms, 9 bathrooms, an independent staff home and elevator, basement and cellar. Located in a historic area of Lisbon, in Belem, closely related with the Junqueira Fountain and classified buildings such as Cordoaria National and Quinta das Aguias. These Lisbon apartments boast excellent fixtures, fittings and finishes and are comprised of 9 units with 1 and 2 bedroom apartments with areas exceeding 150 sq.m. The development with landscaped outdoor spaces and private parking is located between the river and the city, where one can enjoy extensive green areas with terraces, monuments and opportunities to practice outdoor sports. Belem is one of the most celebrated areas of Portugal and is where Vasco da Gama sailed from, to discover India. 2 bedrooms with areas ranging between 152 sq.m. and 178 sq.m. If you’re thinking about buying property in Lisbon, or anywhere in Portugal, for that matter, then take a closer look here at a series of articles that we have produced to help you find and obtain the best deal on property in Portugal. Good hunting! Throughout the years, Campo de Ourique has reinvented itself as a place with undisputed historical and cultural tradition within an environment of great living. Campo de Ourique awakens your senses, the sound of the street and the special aromas that have existed for decades which today, come alive with a new touch of quality. These apartments in Lisbon range from studios to 5 bedroom luxury accommodation, with areas ranging between 59 sq.m and 237 sq.m.. These apartments in Lisbon are defined for their contemporary efficiency and functionality solutions and were designed to offer maximum comfort and convenience. Outside, on top of the roof of the building you will find multiple choices: a dip in the pool, exercise for an hour at the gym or relax for a while in the sun. Only minutes away from Lisbon’s stunning attractions, these uniquely located apartments overlook the historic Tagus River and offer easy access to the Torre de Belem, the marina and gardens, the Cultural Centre of Belem (CCB), and Jeronimos Monastery just to name a few and is the reason why this neighbourhood in Lisbon is so special. These attractive architectural modern apartments in Belem offer a communal garden with swimming pool and consist of 106 luxury properties shared between 5 buildings. These magnificent apartments in Lisbon range between one and five bedrooms with areas ranging between 65 sq.m. and 276 sq.m. with some including terraces. The uninterrupted view to the river and historical monuments enhance a peaceful and relaxing lifestyle.